From the Pouy Ta Mok lookout high in the Dangrek Mountains, visitors can see for miles — a sweeping panorama of farms, forests, and bushfires. What the sylvan vista doesn’t reveal are the attractions that lure a trickle of tourists to this remote district on Cambodia’s northern border: the grave of Khmer Rouge leader Pol Pot, the home of his military commander - ‘The Butcher’ Ta Mok - and countless other tangible reminders of the regime that oversaw the deaths of at least 1.7 million people between 1975 and 1979. Not that the locals need reminding. In the district capital, the past and present coexist in an anxious truce between the vanquished dream of a communist utopia and the harsh capitalism of a border town. “We protected the nation and the territory,” said 73-year-old farmer Tith Morn, who helped defend the last Khmer Rouge stronghold here before the government dismantled the insurgency in 1998. 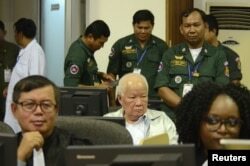 On Friday, the UN-backed Khmer Rouge tribunal convicted the regime’s two most senior living leaders of genocide and handed each a life sentence. Nuon Chea, 92, Pol Pot’s second-in-command, and Khieu Samphan, 87, the Khmer Rouge head of state, had already received the same sentence for crimes against humanity. Along with the prison chief known as Duch, they are the only senior Khmer Rouge leaders who have lived long enough to face a modicum of justice. Im Chaem, a local regime official accused of mass murder and enslavement among other crimes, has enjoyed a peaceful retirement on her farm in Anlong Veng since the charges against her were dropped last year. She recently converted to Christianity. Grandma Chaem, as she is known, is just one of the hundreds of former Khmer Rouge fighters and functionaries attempting to put the past behind them at the scene of their last stand. They work as farmers and cart-pullers, police officers and politicians. But while the view from the Pouy Ta Mok lookout hasn’t changed much in the past 20 years, the district capital is a town transformed. Hotels, karaoke parlors, and beer-branded restaurants flank the dusty red streets. A Sokimex gas station owned by Khieu Samphan’s son dominates the main intersection. At the Choam Sa-Ngam international checkpoint, a few miles to the north, vendors hawk fruit from roadside stalls while cart-pullers tow fish and household appliances for clients back from border-hopping shopping sprees. A garish casino looms over Pol Pot’s inglorious gravesite. 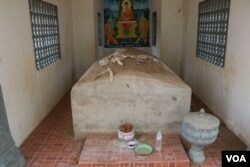 Seng Ra’s family has a foot in the past, present, and future of Anlong Veng. The 27-year-old is a cart-puller at the border, her husband a casino worker and her mother the caretaker of Pol Pot’s grave: a mound of earth covered by a rusted-metal roof in a dusty clearing. “We don’t have a farm,” Ra said, tending to her infant son in their tin-sided shack. A photo above the door shows then-King Norodom Sihanouk and Queen Norodom Monineath during a visit to northern Cambodia’s “liberated zone” in 1973. “We just live here, dependent on transporting goods,” Ra added, explaining that she makes about 30,000 riels per day, or about $7.50. Anlong Veng’s population has swelled to nearly 70,000 in recent years, and 35 percent of residents are former Khmer Rouge cadre, according to Peuy Saroeun, chief of the district council. Although most ex-Khmer Rouge continue to farm the land they spent two decades defending, he said, the “newcomers” are more ambitious. Sieng Hai is one of them. The 43-year-old moved to Anlong Veng from Ratannakiri province in 2005 and opened the predictably named Sieng Hai Restaurant, famous for its stuffed freshwater eel. Hai holds no grudge against her neighbors for their past allegiance to a murderous regime — “they are friendly, and not mean or violent,” she said — but claims they lack entrepreneurial acumen. “They rarely do business. They don’t know how. They are uneducated,” she said, adding that alternate opportunities for quick cash have disappeared with the area’s valuable timber. But if the defectors are largely absent from the local merchant class, they are plainly visible in the political sphere, having been assigned to administrative posts as part of the reintegration process. At the time, efforts were made to preserve the existing hierarchy, according to Sareoun, who was made a deputy commune chief. Later, he was deputy district governor under his Khmer Rouge superior, Yim Phanna, now an army commander in Preah Vihear province with the rank of major general. 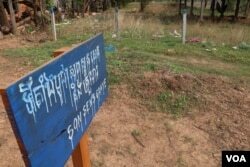 All five communes in Anlong Veng are controlled by former Khmer Rouge officials, along with about 70 percent of the district’s 65 villages, according to Saroeun. But Saroeun does not equate his post-war political career to his prior responsibilities, claiming he was merely a “small soldier” in Pol Pot’s army. And don’t expect other local leaders to be forthcoming about their past positions, Saroeun warned. “Some, like the village chiefs, don’t dare say. If you go and ask them, they will not tell you,” he said. “They are afraid of the court,” he added, referring to the Khmer Rouge tribunal, officially called the Extraordinary Chambers in the Courts of Cambodia. This is the great contradiction of Anlong Veng: a community of one-time Khmer Rouge loyalists with lingering sympathies for Pol Pot and his adherents, but a reluctance to delve into their personal roles. In numerous interviews, residents acknowledged being part of the communist machine, but denied taking part in the torture, starvation and slaughter that wiped out one fifth of the country’s population. Yong Moeun was neither a soldier nor — in her own mind at least — a perpetrator. From 1976 to 1984, she lived in Beijing with her husband, then the Communist Party of Kampuchea’s ambassador to China. An embassy officer herself, she also served as a personal aide to Pol Pot. Upon returning to Cambodia in 1984, she managed the Khmer Rouge leader’s jungle residence in Koh Kong province before retreating to Anlong Veng with the rest of the regime faithful. “Pol Pot had a true vision for protecting the nation and the [Khmer] race,” said Moeun, who now runs a gas station in town. Parked near the town’s main roundabout, a moto-taxi driver described his days sawing planks of wood for building projects overseen by Ta Mok, the Khmer Rouge military commander who ultimately deposed Pot in 1996. “Ta Mok was a good guy. He was honest. He never killed good people,” the man said, declining to give his name for fear of retribution. Nicknamed ‘The Butcher,’ Ta Mok is believed to have ordered the deaths of more than 100,000 people. Morn, the farmer who received “not even a cow,” walks with a limp and suffers from an erratic pulse and unhealed shrapnel wounds. He has more complicated feelings about the Khmer Rouge leadership. Morn said that senior Khmer Rouge officials who defected to Hun Sen’s government prior to 1998 were rewarded, while foot soldiers like him were forgotten, left to subsist off the land. “The high-level Khmer Rouge got rich,” he said. Morn grows rice, corn and cassava on a 6-acre farm he cultivated after clearing a patch of unclaimed forestland. So Samouen, a former Khmer Rouge soldier who moved to Anlong Veng with his wife and daughter last year, feels shamed and stigmatized. “I am afraid that people will hate me, and that they will do something, like take revenge,” said Samoeun, who makes a meager living selling scavenged plastic scraps. Like Morn, he cringes from the pain of wartime wounds. “I don’t have money for treatment,” he said. Samoeun even hid his past from his wife, Marn Chantha, until after they were married. “If I knew he was Khmer Rouge, I wouldn’t have married him,” said Chantha, whose parents and two siblings were killed under the regime. Youk Chhang, director of the Documentation Center of Cambodia, or DC-Cam, explained that there remains a trust deficit among the citizens of post-war Cambodia. “Trust, in our society, remains a fragile glass,” he said, entreating the public to be open-minded about the residents of Anlong Veng. “We should not make prejudgments about whether they are telling the truth or not about what they did during the Khmer Rouge time,” he said. “Anlong Veng’s future will primarily be shaped by its people, and the people of Anlong Veng offer a diversity of experiences that provide a window into the legacy of the Khmer Rouge regime, the horrors of war, and the incredible beauty and courage of humanity in extreme adversity,” write Dy Khamboly and Christopher Dearing in their history of the area. DC-Cam hopes to have a hand in that future. In 2016, it helped launch the Anlong Veng Peace Center, a modest museum housed in a mountaintop structure once used as a meeting space by Khmer Rouge leaders. With the goal of promoting reconciliation and understanding, DC-Cam also leads “peace tours” of the 14 official historical sites in Anlong Veng, including the homes of Pol Pot, Ta Mok, Khieu Samphan and Son Sen, the Khmer Rouge defense minister. 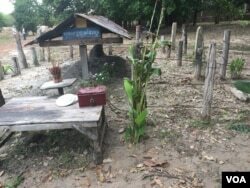 “To reconcile in Anlong Veng is to define justice,” Chhang said, suggesting that while the area’s inhabitants played a role in the Khmer Rouge’s crimes, they too experienced loss. “Justice can also be defined as a fairness of what they did to others during the Khmer Rouge time and what they have been through,” he said.